Posted on November 16, 2015 at 2:46 pm. This time of year I find myself falling back in love with running. For the obvious reasons — cooler weather, beautiful fall scenery, lots of time on the trails (before the hunters ascend) — and also because I’m not in high training mode. As much as I enjoy the challenge of ticking off the miles in preparation of a goal race, running simply to run is pretty magical. I don’t typically have big goal races late in the year, and this is deliberate on my part. I’ve learned that my body and mind train best in the coldest of months, not during the humid days of summer, so though I may sign up for a 10K, 15K or half marathon in July and August or throughout fall, these races typically are less about finishing in a certain time and more about enjoying the moment, feeling good and not over doing it. They’re part of my bigger goal of maintaining my year-round fitness. They’re fun. 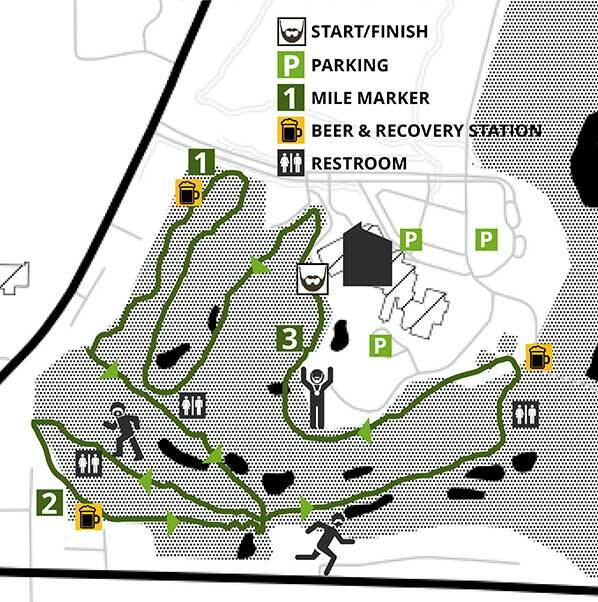 Which brings me to this weekend’s running adventure: The Great Beerd Run at Grand Traverse Resort and Spa. 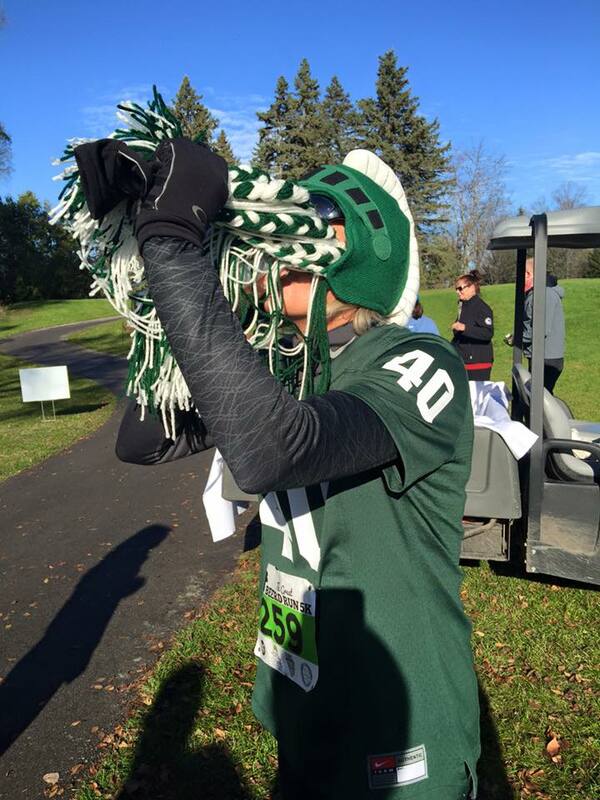 This 5K — untimed and featuring on-course refreshments thanks to three northern Michigan breweries — was an entirely new experience for me. And also perfectly timed to my loving-not-training frame of mind. Joe and me just before the race start. But on Saturday, I gave it a try–and it was a blast. Joe and I met up with his brother and girlfriend and several other friends to participate in this second annual event. 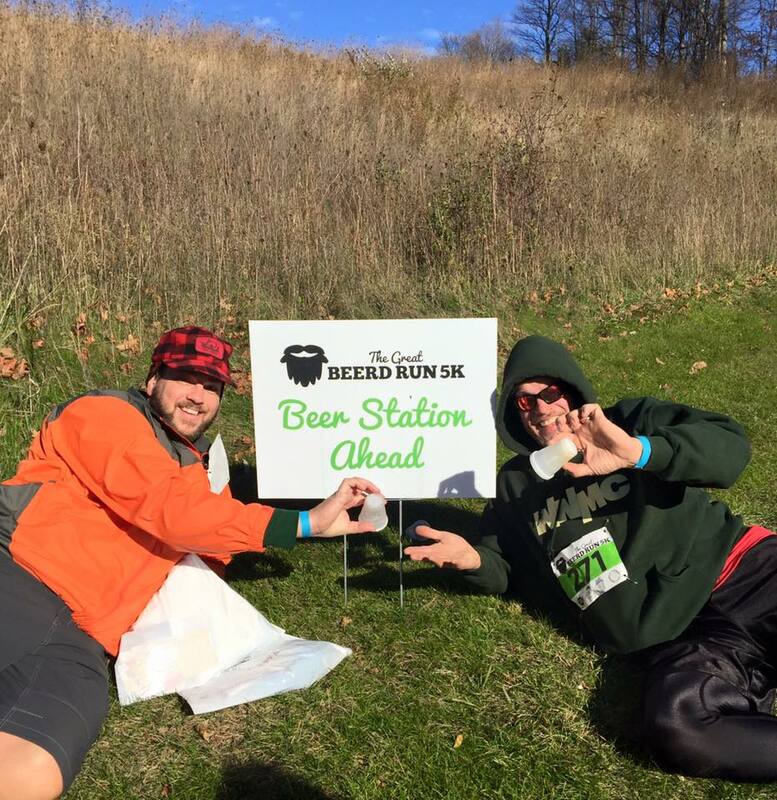 The Great Beerd Run partners with Bellaire, Mich.-based Short’s Brewing, Petoskey’s Beards Brewery and Traverse City’s Right Brain Brewery to offer runners on-course samples of their beer. 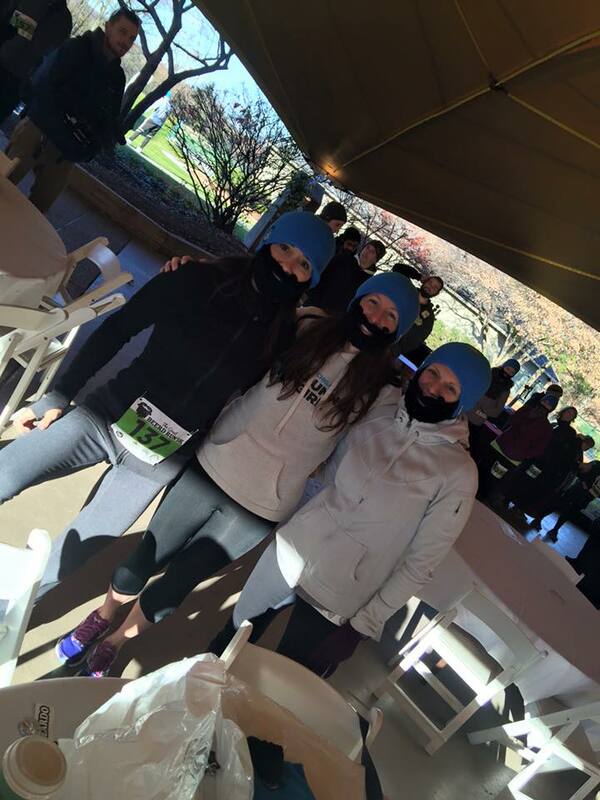 For $40, your race entry includes three on-course samplings (and a pint during the post-race party), bottle opener finisher’s medal and the coolest knit beard cap — I wore my Beardo knit cap for the first half of the race, then took it off as the sun peeked out from behind some clouds and I’d warmed up some. As for the race’s focus on beards, a portion of the proceeds is donated to No-Shave November, a non-profit organization devoted to growing cancer awareness and supportive funds. Participants are encouraged to get creative with their beards, whether natural or homemade. And the creativity definitely came out in full force! We saw beards decorated with “hops,” beards made out of beer bottle caps, elaborate beards made of yarn (a favorite: a friend’s homemade green-and-white yarn Spartan beard). Our friend Katrina made her awesome MSU beard. Here she is on course, taking a sip of some of the awesome Michigan craft beer. Prizes were awarded for the Best Natural Beard as well as for the Best Assisted Beard. Prizes included a Right Brain Brewery Ultra-Pass and a Right Brain Brewery Tour pass for the winner and seven friends that takes you behind the scenes at the Traverse City based production facility and tasting room. The Ultra-Pass also included special discounts on merchandise and beer. 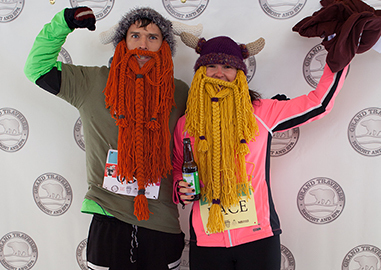 The fastest male and female scored epic Nordic inspired beard/hat sets. /PHOTO courtesy Grand Traverse Resort and Spa. We arrived at the Grand Traverse Resort and Spa on Friday, the night before the race. 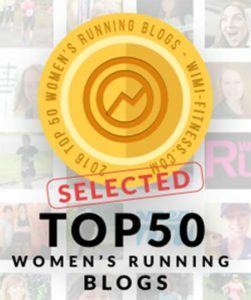 MRG partners with the Grand Traverse Resort and Spa — the weekly Michigan Runner Girl podcast and the monthly Michigan Runner Girl newsletter is supported by the Resort — and the race’s organizers generously provided us with lodging for the weekend. We’ve stayed here in the past, most recently as a “stay-cation” for our family a few years ago when we decided to stick around Traverse City for spring break, so our kids were very excited to spend some time at the Resort’s indoor pools and water slide and Tower shops this past weekend. The race start time of 10 a.m. is perfect for a fun run — it meant we had time to sleep in some and have a cup of coffee (as our kids continued sleeping in…a nice perk of having older kids now). We headed downstairs to the Pavilion area, where race day packet pick-up and registration got underway. We had time to snap some photos with friends and get ready for the race start just a few steps away. The loose plan was to run easy with Joe and my good friend Jen. 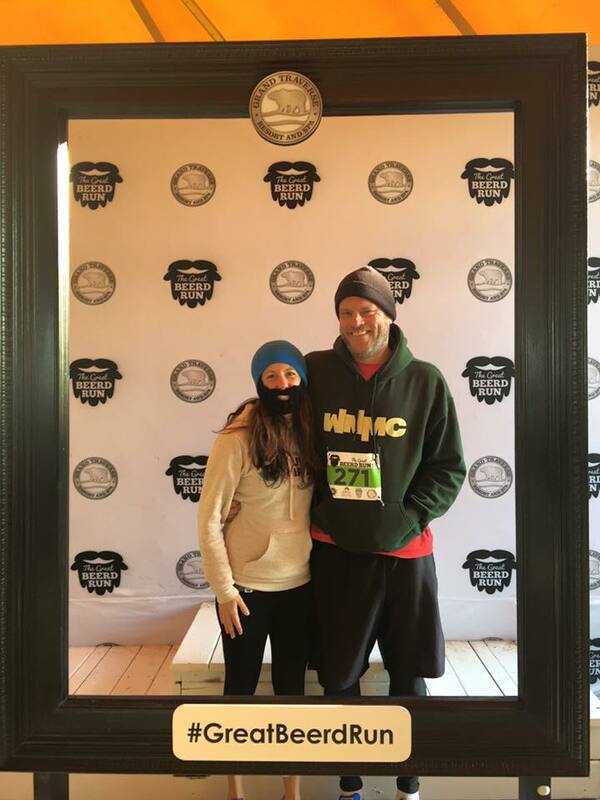 Joe’s brother Jason and his girlfriend Nicole, meanwhile, had decided they would walk the course with a group of friends, enjoying the brisk morning and savoring the beer along the way. It wasn’t long before Joe, Jen and I decided to do the same. It was around the second mile, when we’d had our second sample — Dead Kettle, an IPA from Right Brain Brewery — when we discovered we were bringing up the rear with a large group of walkers. 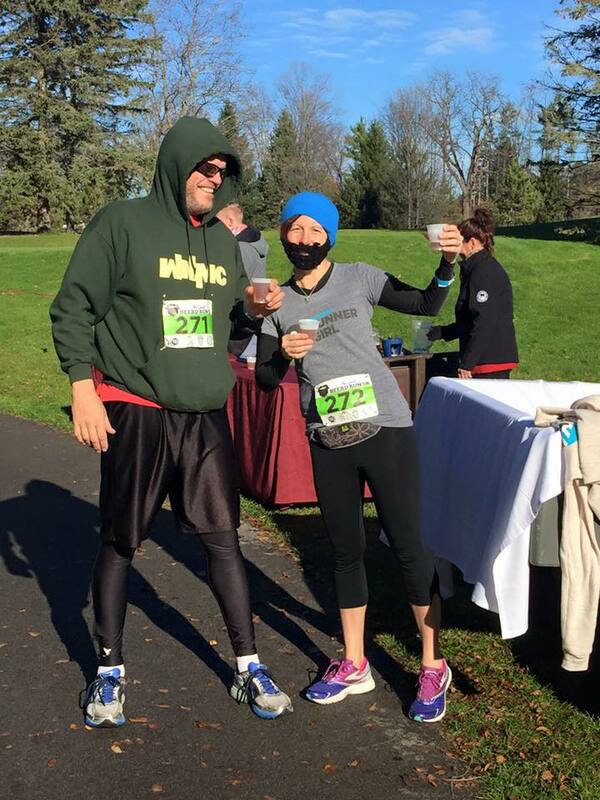 The sun was shining, the sky a clear blue, and we were a bunch of runners/walkers sipping great beer on the pathways winding through the Resort’s beautiful grounds … it was a pretty perfect way to spend a Saturday morning. And to think it was November 14. We couldn’t have asked for better weather for a late fall day in Michigan. Jen, me and Pam just before the run began. Joe and me at the second beer station. Jason and Joe. We loved the clever race course signage. Joe edged me out at the finish…yep, I was dead last! It was so much fun! Thank you, Kelly, Eric and J. Michael from the Grand Traverse Resort and Spa for making this weekend such a fun experience for us! 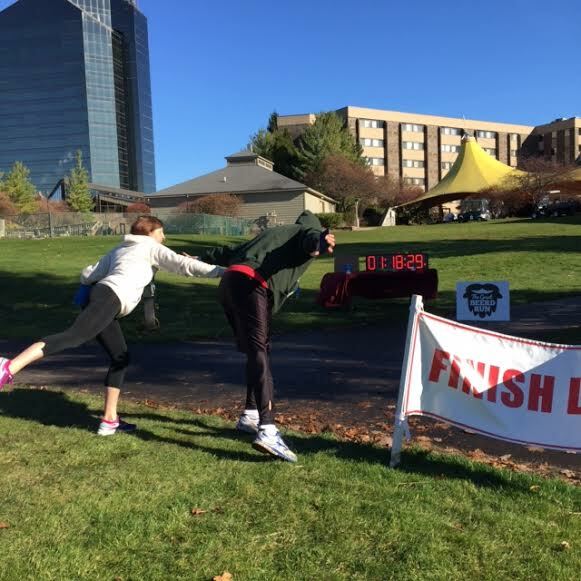 Do you participate in fun runs like this one? 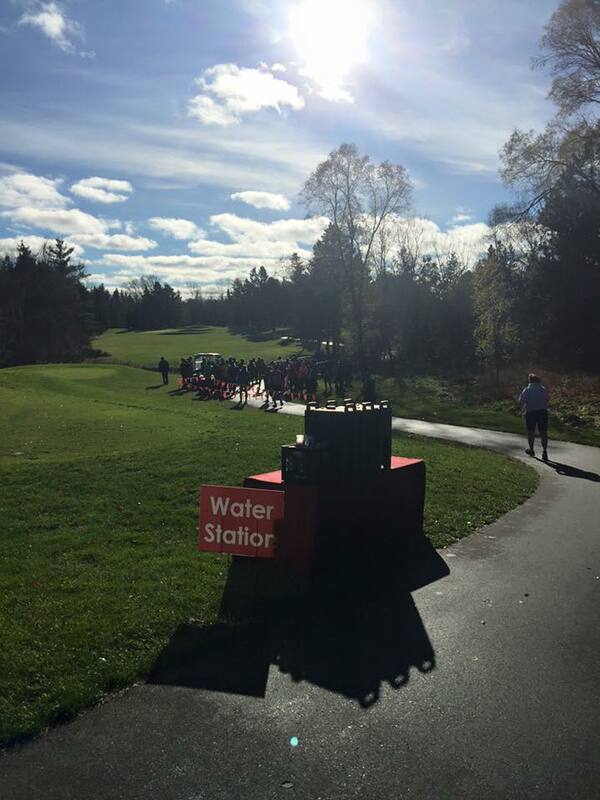 Have you run one that includes beer on the course? Looks like you all had a great time! Pictures were a riot! !